UEM Land offered RM2.80 per share in an all-share deal but Sunrise shares rose 28 per cent to close at RM3.22 yesterday. UEM Land Holdings Bhd has no plans to raise its bid for Sunrise Bhd after the latter's share price jumped above the offer price yesterday. It offered RM2.80 per share in an all-share deal but Sunrise shares rose 28 per cent to close at RM3.22 yesterday. Although major shareholders with a 40.34 per cent stake have agreed to the offer, UEM Land still needs another 9.7 per cent for the deal to happen. "We believe the current market price of Sunrise is only reflecting the proposed dividend announced, the proposed offer structure and the pricing of our offer to acquire Sunrise at RM2.80 per share," UEM Land said in response to Business Times' questions. Sunrise shareholders are offered 1.33 UEM Land shares for every share they hold, priced at RM2.10 each. "As such, any increase in UEM Land share price, will result in a proportionate increase in Sunrise share price as to reflect the proposed structure and pricing," it added. 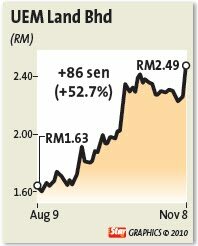 Shares of UEM Land rose 10.2 per cent to close at RM2.49 yesterday. Most analysts think the offer, which values Sunrise at RM1.4 billion, is low. AmResearch Sdn Bhd said the offer means UEM Land is getting Sunrise at a 28 per cent discount to its estimated net asset value (NAV) of RM3.89 a share. OSK Research said there is a 31 per cent discount to its 2011 target price of RM4.33, based on the offer price and after adding the recently-announced net interim dividend of 20 sen. But ECM Libra reckons that not everything can be based on numbers in this deal, as the fact that major shareholders are accepting could mean a lack of growth prospect for Sunrise. Datuk Tong Kooi Ong, a major shareholder of Sunrise, is staying in a senior management role in the enlarged group. "As such, the question to ask is whether the existing major shareholders of Sunrise expect positive value creation from this exercise," ECM Libra said in a report. Analysts also think that the deal may spark more takeovers in the sector. There is speculation of a deal between IJM Land Bhd and Bandar Raya Development Bhd (BRDB). BRDB, famed for crafting thriving communities like Bangsar, has land surrounding its CapSquare development and along the Federal Highway. MIDF Research senior analyst Syed Muhammed Kifni thinks that Sime Darby Property Bhd and Mah Sing Group Bhd would be a good fit. PETALING JAYA: Analysts have mixed views on UEM Land Holdings Bhd’s RM1.4bil takeover offer for Sunrise Bhd, with some of them saying that UEM Land will emerge “the bigger winner”. Having already secured 40.34% of the voting shares, if its bid succeeds, UEM Land will become one of the largest property developers in the country, with land and projects in Iskandar Malaysia, the Klang Valley and abroad. Last week, UEM Land proposed a conditional takeover to acquire all the equity shares in Sunrise at RM2.80 per share via a share swap of 1.33 UEM Land shares at RM2.10 for each Sunrise share or a share swap of 2.8 redeemable convertible preference shares (RCPS) at RM1 for each Sunrise share. In terms of land, the enlarged group would have expanded its acreage from 4,164 acres, of which 98% are in Iskandar Malaysia, to 4,741 acres with 86% in Iskandar, 9% in Mersing and 5% in the Klang Valley. This acreage will exceed that of SP Setia Bhd, which has 3,453 acres. The enlarged entity will also have a combined gross development value (GDV) of RM27.6bil. On its own, UEM Land has a GDV of RM20bil, about the same as IJM Land Bhd, which has over 5,000 acres. Three out of five analysts said the takeover was “attractive” for Sunrise shareholders. Their views also differed on which was a better option for shareholders. OSK Research said while the share-for-share swap offered most reward potential, it was not without risk as the the entities had very different culture with one being a government-linked company under Khazanah Holdings Bhd and the other a pure breed private sector animal. Merging their operations would be herculean. Accepting the RCPS had limited downside risk as the RCPS could be redeemed at face value by UEM Land two years later. “However, as the RCPS will not be listed, there will be no early exit for the investor and he must take into account the potential opportunity cost involved,” OSK said. Another option was to cash out on or after the Nov 18 ex-date of the recently-announced 20 sen interim dividend and invest in other property stocks as OSK believed the Malaysian property sector was on the verge of positive re-rating over the next 12 months and investors may find more attractive options elsewhere. ECM Libra Research said an analyst briefing on Nov 4 suggested that the main reason for Sunrise executive chairman Datuk Tong Kooi Ong to sell his stake was the landbank constraint of Sunrise. At another analyst briefing several months earlier, Tong indicated that he was taking Sunrise onto a new strategy with multiple products and multiple locations. While its joint venture with Sime Darby group in Bukit Jelutong, Shah Alam and its projects in the Kuala Lumpur city may be part of this strategy, ECM Libra said with this turn of events, the “potential for (the) enlarged entity to reap synergistic benefit of large landbank (UEM Land’s) and the development exeprtise and strong branding Sunrise” was there. Tong will take up a board seat in UEM Land and remain as Sunrise chairman. He will also chair the development committee in the enlarged group. ECM Libra said despite the unattractive takeover offer, valuation wise, not everything could be quantified in this particular corporate exercise. “The question we have to ask is whether the sale of stakes by major shareholders especially Tong, who is instrumental in the success of Sunrise, signifies the lack of growth prospect going forward and thereby (led to) their exit,” said ECM. However, that Tong would continue to play a crucial management role in the enlarged group begged another question – would the existing major shareholders of Sunrise expect positive value creation from this exercise, that is, the consideration shares in UEM Land to be worth a lot more in two years despite its current stretched valuation, the research house asked. Meanwhile, shares in Sunrise and UEM Land jumped when trading on Bursa Malaysia resumed yesterday following a two-day suspension last week to announce UEM Land’s takeover plan. UEM Land gained 23 sen to its all-time high of RM2.49. The counter has risen more than 102% year-to-date. Sunrise gained 27.78%, or 70 sen, to RM3.22, its highest since Jan 29, 2008 when it hit RM2.80. It was the second most traded stock on Bursa with 44.7 million shares exchanging hands. Year-to-date, Sunrise has gained more than 56%. Its closing price yesterday was much higher than the offer price of RM2.80 by UEM Land. An analyst believed UEM Land would easily secure 50% acceptances level but doubted if the company would revise the offer price so soon. He said investors could be buying into Sunrise yesterday due to the dividend which was announced last week. Apart from the net dividend, analysts were unsure on the reason behind the rise in Sunrise’s share price. Investors could easily buy into UEM Land if they wanted to buy Sunrise as a proxy to the former. Based on yesterday’s closing of RM3.22, 1,000 Sunrise shares cost RM3,220 and 1,000 UEM Land shares, RM2,490. Under the direct share swap, the 1,330 UEM Land shares received for 1,000 Sunrise shares would be worth RM2.42 each. In contrast, purchasing the 1,330 UEM Land shares directly would cost RM3,311.70, or RM2.49 each. Another analyst said there was no guarantee that UEM Land would make a better offer in a subsequent round, if any. The much anticipated 1Shamelin mall in Cheras is scheduled to be completed by the second quarter of 2011 with a host of amenities set to bring in shoppers. A sneak preview of the nine-storey mall located at Taman Shamelin Perkasa was held recently for the media at Westin Hotel in Kuala Lumpur. The new mall boasts a gross build up of one million square feet with over 1,000 stores with 1,500 carparks for some 500,000 residents who lived nearby. For entertainment shoppers can choose from Tanjong Golden Village Cinemas (TGV), One Pioneers Badminton Academy, Amp Square Karaoke to CYC Mega Leisure. According to the mall’s senior complex manager Wong Chee Keong, fashionistas will enjoy themselves at the street bazaar located at the Lower Ground, Ground and Upper Ground floors. “We have young entreprenuers who are arbiters of style and fashion who will start their own business. We hope they take up this opportunity and share their successes with us,” he said. There are also themed zones such as Trendy & Fashion, Cyber & Lifestyle, Integrated, Eateries & Snack, Beauty & Pamper, Health Care & Academic as well as Sports & Entertainment. Shoppers can also enjoy the gastronomic delights that will be available 24 hours by alfresco eateries surrounding the mall. “Usually, shopping centres adopt two stages and stage two involves expansion with increased lettable area adjacent to existing spaces. In our case, we have two stages that will be developed at the same time,”Wong said. The phase two is right above phase one and will have three extra floors dedicated to the entertainment and sports hub. The third floor will house a supermarket and household stores, the fourth floor will have the badminton academy, health care, sports and lifestyle retail stores while the fifth floor is dedicated to TGV with eight screens. For badminton enthusiasts, the badminton academy with 14 courts led by Malaysia’s top badminton players Wong Choong Hann, Lee Wan Wah, Chew Choon Eng and Chan Chong Ming will be a must try. For now more than 50% of the retail outlets have been taken up.